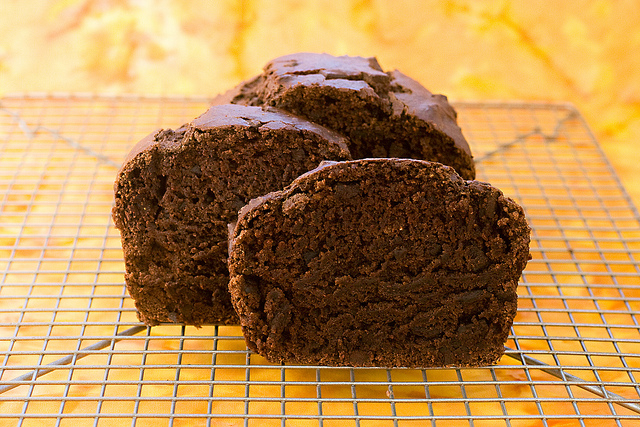 Original recipe from Post Punk Kitchen: http://www.theppk.com/2011/10/chocolate-pumpkin-loaf/ Delicious, rich, sweet and moist! Also freezes well so I usually make extra. Have ready an 8 x 4-inch nonstick or silicone baking pan. Also, boil some water in a tea kettle (no need to measure yet.) Combine the applesauce and cocoa powder in a large mixing bowl. In a separate bowl, sift together the flour, cinnamon, nutmeg, ginger, cloves, baking soda and salt. Measure out 1/3 cup boiling water and pour it into the bowl with the chocolate mixture, mixing quickly to make a smooth chocolate sauce. Add the pumpkin, dry sweetener, almond butter, and vanilla and mix well. Dump about half of the flour mixture into the chocolate mixture and gently stir just to incorporate, then measure out 1 tablespoon of boiling water, add it to the mixture, and stir again. Add the rest of the flour mixture, and another tablespoon of boiling water, and stir just until smooth (do not overmix). Fold in the chocolate chips. Spoon the batter into the prepared loaf pan. It will be good and thick. You can smooth the top out with a spatula. Bake for 55 to 60 minutes. Stick a steak knife into the center of the loaf to check for doneness. A little bit of wetness is okay since it could be from a chocolate chip, but the knife should come out mostly dry. Remove the loaf from the oven. Let cool for 10 minutes, then run a knife around the edges and carefully invert the loaf onto a cooling rack to cool most of the way. It’s yummy a little bit warm, or thoroughly cooled.